Being green is getting a lot harder for eco-friendly states in the US, thanks to the country’s dependency on overrun Chinese recycling facilities. Recycling centers in Oregon recently stopped accepting clear plastic “clamshell” containers used for berries, plastic hospital gowns and plastic bags, as the Ashland Daily Tidings reports. Yogurt and butter tubs are probably next. In Olympia, Washington, recycling centers are no longer accepting plastic bags. California’s farmers are grappling with what to do with the 50,000 to 75,000 tons of plastic they use each year. Hardwood is referring to China’s “Green Fence” campaign banning “foreign garbage” (link in Chinese). China has rejected 68,000 tons (61,700 tonnes) of waste in the first five months of 2013, when the program was officially launched. The Green Fence initiative bans bales of plastic that haven’t been cleaned or thoroughly sorted. That type of recyclable material, which costs more to recycle, often ends up in China’s landfills, which have become a source of recent unrest in the country’s south. Instead of investing in the sorting and cleaning technologies required to process soiled and unsorted recyclables, which both China and the US have been reluctant to do, China’s Green Fence policy blocks the import of those plastics. As a result, US recycling centers that once accepted scrap plastic for recycling are being forced to send it to American landfills. As we’ve discussed before, Americans generally don’t recycle their plastic; they export it. And more than half of the $1 billion a year business goes to China. ​​The full-year projection for 2013 is based on January-June data. Green Fence has contributed to the 11% decline in export value of US plastic scrap in the first half of 2013, compared with the same period in 2012. China’s customs data reflect that too. It imported 20% less plastic scrap in Q2 than the same quarter of 2012, a value of $300 million less. And yet, Chinese processing factories desperately need US plastic. Once reprocessed, it’s used to make everything from polar fleeces to stadium seats. 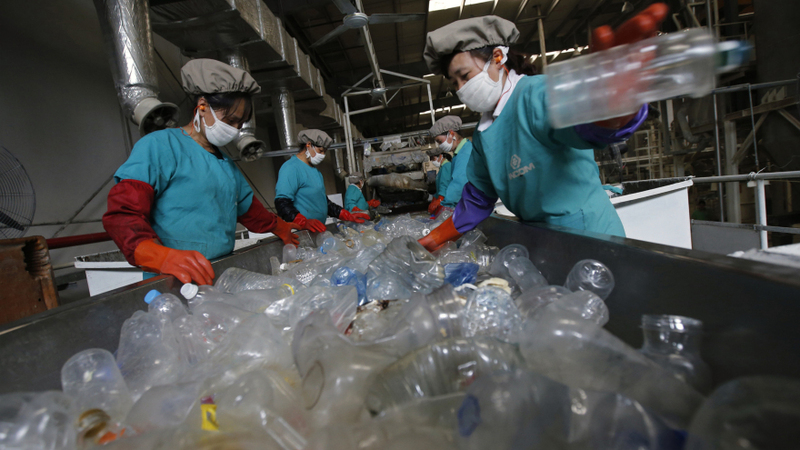 China imports around 40% of the world’s plastic scrap, collecting the rest domestically. Now that China’s plastic scrap supply is being squeezed by Green Fence bans, plastics smuggling at ports and in cities (links in Chinese) is on the rise. For every ton of reusable plastic, China has received many more tons of random trash, some of it toxic. That has helped build “trash mountains” so high they sometimes bury people alive (link in Chinese). For a country facing environmental crisis after environmental crisis, this is no longer tenable. Because US trash exporters haven’t been forced to spend on technology or labor to sort and clean trash piled up at its recycling centers—Chinese laborers have handled that part—those shipments have been profitable for US exporters. But Green Fence is shifting those economic incentives; It costs the US around $2,100 per shipping container to return rejected trash to California ports. Those high costs may drive the US to expand its own recycling capacity. Until then, American pollution will no longer be piling up in China; It will be festering at home. This entry was posted in Environmental News, Latest Blogs, Plastic news, Recycling and tagged APR, china green wall, green wall, recycling garbage, recycling plastics, recycling problems, US recycling on August 26, 2013 by danny.clark. US recyclers are nervous about losing their largest market after China began enforcing new environmental laws this year. Have you ever wondered what happens to the soda can that you toss into a recycling bin? Chances are high that it ends up in China – like 75 percent of the aluminum scrap that the United States exports. Or 60 percent of its scrap paper exports. Or 50 percent of its plastic. But a new Chinese edict, banning “foreign rubbish,” has thrown the international scrap and waste trade into turmoil and is posing a major new challenge for US recyclers. Operation Green Fence, a campaign by Chinese customs to strictly enforce laws governing the import of waste, “could be a game changer,” says Doug Kramer, president of Kramer Metals, an international scrap dealer in Los Angeles. “A lot of companies have used China as a dumping ground, getting rid of … substandard scrap and trash,” Mr. Kramer says. As China’s government seeks to raise environmental standards, he says, “I understand China’s need to take a hard look” at its imports. That hard look, involving stepped-up inspections of containers filled with scrap metal, paper, and plastic at Chinese ports and a merciless application of the rules, has intercepted more than 800,000 tons of illegal waste since the campaign began in February, according to the customs agency. Now nervous traders are refusing to ship consignments of recyclables that might contain unacceptably large amounts of unrecyclable materials (anything from unwashed items to the wrong kind of plastic to random bits and pieces of garbage that get mixed in with the recyclables). And cities and towns across the US and Europe are finding there is no longer a ready market in China for their poorly sorted and often impure bales of plastics, paper, and other waste. “A butterfly in China has caused a tornado in Europe,” Surendra Borad, chairman of Gemini, the world’s largest collector of waste plastic, told the Bureau of International Recycling (BIR), an international federation of recyclers, at its annual convention in Shanghai last month. However, China is not bringing down the hammer on every kind of scrap (and “scrap” is the preferred term of art). The country has few resources of its own, and its fast-growing industry relies heavily on reprocessing other countries’ plastic soda bottles into fabrics, or their junked metal into machinery. “Making proper use of this scrap supplements China’s resources, helps save energy, protects the environment, and boosts economic efficiency,” Li Xinmin, a former pollution inspector at the Chinese Ministry of Environmental Protection, told a recent meeting of the China Metals Recycling Association. But in China, much of the imported plastic scrap, for example, is recycled in primitive, family-owned workshops with no facilities to treat waste water before it flows into local rivers. And Chinese recyclers “have got used to expecting 20 percent trash” in the bales of mixed plastics they buy from the US, according to David Cornell, technical consultant to the Washington-based Association of Postconsumer Plastic Recyclers. That trash has to be sorted from the recyclables, then buried or burned, further degrading China’s environment. Though Chinese regulations have long banned excessive levels of contamination in imports of recyclables, they were rarely enforced until Green Fence was launched, traders say. 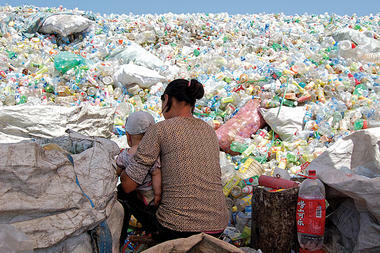 “Before, we were able to import dirty materials and bottles, but not any longer,” explains Sun Kangning, who owns a small plastics recycling plant in the village of Laizhou in Shandong Province (see sidebar on the industry’s woes). Since February, he says, 24 shipping containers of plastic waste that he had bought from the US have been turned away by customs – about 20 percent of his business. Because the government finds it hard to control all the mom and pop makeshift recycling workshops, it appears to have chosen to enforce environmental standards on imports at the pier. The international trade has boomed partly because the US cannot dispose of all the waste it generates; the country has neither enough recycling facilities nor sufficient manufacturing demand for all its scrap. The rising overseas sales of paper, aluminum, copper, plastics, and steel also have to do with the nitty-gritty economics of America’s trade deficit with China. Because China exports so much more to America than it buys back, the shipping containers from Shanghai that are full of computers, mobile phones, and TVs on the journey to Long Beach, Calif., risk returning empty for the trip back. Shipping companies, seeking to cut their losses, offer bargain rates on their westbound freighters: It is cheaper to ship a 40-foot container full of iron scrap from Los Angeles to a Chinese port than it is to send it by train to a foundry in Chicago. US and Chinese scrap merchants have not been slow to take advantage of the deals. At the same time, sorting and recycling is a lot cheaper in China, where wages are a fraction of US levels. At Mr. Sun’s courtyard processing plant, for example, women using box cutters to strip labels from plastic soda bottles before they are ground up earn about $15 for a day’s work. Some traders say the new policy in China has forced them to sell their scrap in different countries, such as Vietnam, Indonesia, and Malaysia, where it is either reprocessed or simply sorted and cleaned to the new Chinese standards and then shipped on to China. “We’ve seen a pretty good uptick in shipments to Southeast Asia,” says Joe Pickard, ISRI’s chief economist. But capacity there “is not sufficient to take up the slack from China,” he adds. Nor are the new destinations likely to tolerate being the planet’s trash can indefinitely, predicts Kramer, who sells American scrap iron and nonferrous metals in several Asian countries. ” ‘If you can’t send it anywhere else, send it here’ is not the kind of message anyone wants to send,” he says. How long will this last? Some businesses do not expect Chinese customs officials to go on being so zealous for long. Indeed, previous similar crusades have petered out in the past, and the General Administration of Customs in Beijing has announced that its current campaign to “reinforce inspection and prevention work in key areas” will end in November. The first four months of the campaign have certainly hit the Chinese recycling industry – raising prices for some recyclable materials that are now in shorter supply. “Our industry is really facing a very big adverse impact from the stricter environmental standards,” complained Huang Chongsheng, chief executive officer of aluminum scrap smelter Ye Chiu Metal Recycling at last month’s BIR conference. US recyclers, too, are beginning to feel the effects, especially those who collect, sort, or trade low-end materials, such as the cheaper sorts of mixed plastics often extracted from household waste. “The market for mixed rigids [such as plastic yogurt containers, margarine tubs, or buckets] has gone to hell in a handbasket,” says Jeff Powell, publisher of Resource Recycling magazine. “Mixed paper and mixed plastics are being put into landfill” now that they cannot be sold to Chinese recyclers, he adds. “We used to send garbage because it was the cheapest thing to do and because the Chinese would accept it,” Mr. Powell explains. The new Chinese policy, he says, will force US recyclers either to sort recyclables more carefully, or to recycle more material in the US, or both. US processors “are beginning to dip their toes into” that future, says Mr. Schipper, but they are constrained by the cost of more sophisticated machinery. Already, however, US businesses handling scrap are dealing with it more carefully, according to Steve Alexander, spokesman for the Association of Postconsumer Plastic Recyclers. “People who took the easiest route” before by baling and selling heavily contaminated material “may be running it through a second sorting step, putting it through optical sorters,” he says, because that is what the market now demands. That means that more of the plastic ends up where it is meant to be, and less gets thrown away or burned, either in the US or in China. “Environmentalists love Green Fence,” says Powell. This entry was posted in Environmental News, Latest Blogs, Plastic news, Recycling and tagged APR, china green wall of trash, dave cornell, dirty secret of recycling, recycling, recycling innovation, recycling rates, recycling subsidized on June 24, 2013 by danny.clark. Are You Confused About What to Recycle? When is the last time you asked yourself or someone else if something was recyclable? It a common question and one that gets many different answers depending on what packaging or material you are asking the question about. Most recycling programs will have information readily available to the public on what they will accept in the recycle bins. This list however is quite small and becomes apparent that what recyclers are looking for is the cream of the crop. If you are anything like me you put everything in the recycle bin and hope that it will motivate recyclers to start taking more material. People in general want to do the right thing and truthfully speaking it’s a great feeling to know we are doing our part to help recycle when we do make the effort to recycle. I suppose someday recycling will become a mainstream religion – to a very few it already is. I often wonder what recycling would look like if people got paid for their recyclable materials? After all for decades aluminum cans provided a source of additional funds to many and this resulted in very high recycling rates for aluminum cans. It would sure make it a little more worth the effort to sort through and place materials in the proper bin. The April 1st, 2013 issue of Plastics News had a great Viewpoint article by Don Loepp which addressed this very issue as a discussion point from the March Plastics Recycling Conference in New Orleans. If we are going to have recycling be a big part of the environmental solution to the growing global plastic pollution issue we are going to have to get aggressive about our recycling efforts and recyclers will need to be a stakeholder in the bigger environmental mission as much as they are with the business focus of recycling. 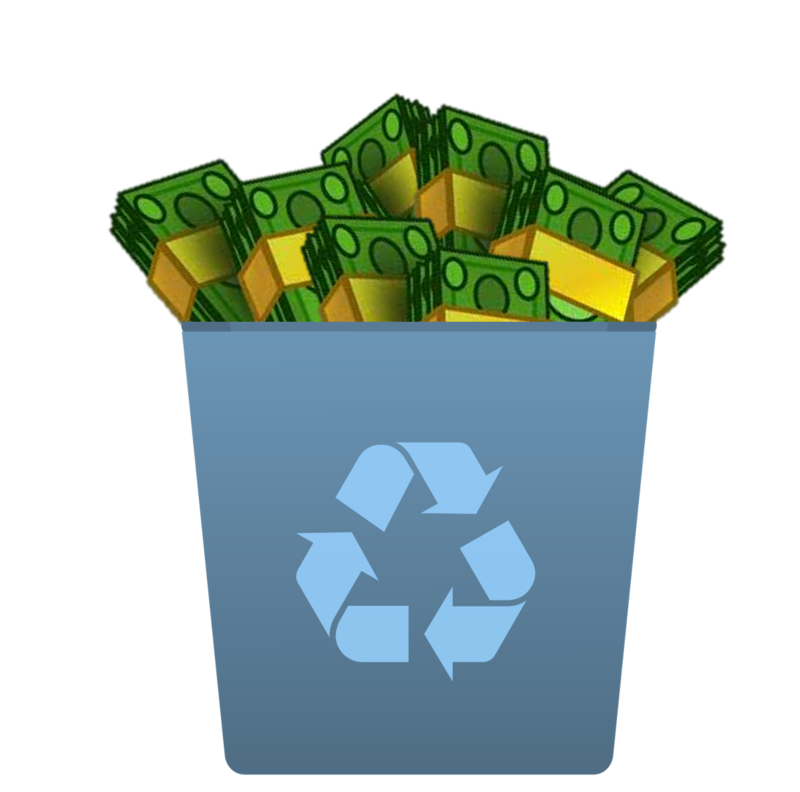 All materials have the potential to be recycled, let involve state and federal programs to bring innovation to the market so that recyclers can accept all materials and have markets to sell those materials. We’d love to hear what you think? This entry was posted in Biodegradation, Bioplastic, Labeling and Claims, Latest Blogs, Recycling, Thought Provoking and tagged APR, bioplastics, curbside recycling, ENSO biodegradable bottle, NAPCOR, plastic recycling, recyclers, recycling, what happens when you recycle on April 9, 2013 by danny.clark. Recycling – Is it just a business? This is a question that I’ve been mulling over for the past couple of weeks. Recently I’ve been reading books and articles that suggest that recycling is more of a business than an environmental solution. The articles claim that the majority of the recycling industry is not based on “helping the environment” but is about picking the easiest and largest money making bottles – #1 PET and #2 HDPE beverage bottles. This entry was posted in Latest Blogs and tagged APR, environmental laws, government, NAPCOR, Plastic Bottles, plastic recycling, recycling, recycling containers, recycling plastic bottles, recycling rates on August 31, 2009 by danny.clark.